As our last reading before the summer hiatus, we have chosen to explore the ongoing, heated, very complicated moral and ethical debate over who owns the past and who (should) have the right to dig, sell and/or retain the artifacts found. Author and naturalist Craig Childs views the battleground and the adversaries from all sides. He takes us from the Americas to Asia and elsewhere, spinning fascinating tales of his own experiences with excavations, looting, museum holdings and art markets and those of others, and engaging the reader in the process by asking who is right and who is wrong, who are the good guys and who are the bad ones. Are the archaeologists, museum curators and scholars always the good guys? Are the looters, private collectors and ordinary people who dig up objects always in the wrong? “If anyone tells you there is only one right answer to the conundrum of archaeology, he is trying to sell you something,” Childs writes. Blue Mesa was Cather’s stand-in for Green Mesa — Mesa Verde in southern Colorado — and she was evoking what a real cowboy, Richard Wetherill, might have felt when, a week before Christmas 1888, he found Cliff Palace, the centerpiece of what is now Mesa Verde National Park. 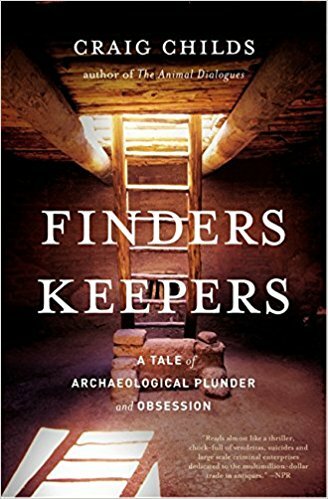 Craig Childs understands these kinds of epiphanies, and he beautifully captures them in “Finders Keepers: A Tale of ­Archaeological Plunder and Obsession” — along with the moral ambiguities that come from exposing a long-hidden world. Wetherill’s city of stone, Childs reminds us, was quickly commandeered by a Swedish archaeologist who, over the objections of outraged locals, shipped crates of Anasazi artifacts to Europe. Worse things could have happened. Childs tells of a self-proclaimed amateur archaeologist who in the 1980s removed hundreds of artifacts from a cave in Nevada, including a basket with the mummified remains of two children. He kept the heads and buried the bodies in his backyard. In his explorations of the Southwest, Childs has often crossed paths with pot hunters and private collectors. Most were driven by curiosity and the excitement of discovering lost history. Cather understood the impulse: ‘There is something stirring about finding evidences of human labor and care in the soil of an empty country,’ Tom Outland says in the novel. ‘It comes to you as a sort of message, makes you feel differently about the ground you walk over every day.’ Then you have to resist the urge to take home what you have found. Let’s discuss it on June 21!